The JBL OnBeat Air wireless AirPlay loudspeaker docking station provides wireless remote access to your entire iTunes 10 music collection and iTunes Internet radio. You’ll get full navigation and playback control via your iOS device using the free Apple Remote app. The AirPlay app is easy to set up and use on the JBL OnBeat Air dock with virtually any Wi-Fi network, including WPA (Wi-Fi Protected Access) systems. You’ll have convenient access to your music. Go ahead and rock out to your favorite tunes: The JBL OnBeat Air dock’s 7.5 watts per channel lets you crank up the volume for a whole party to enjoy. 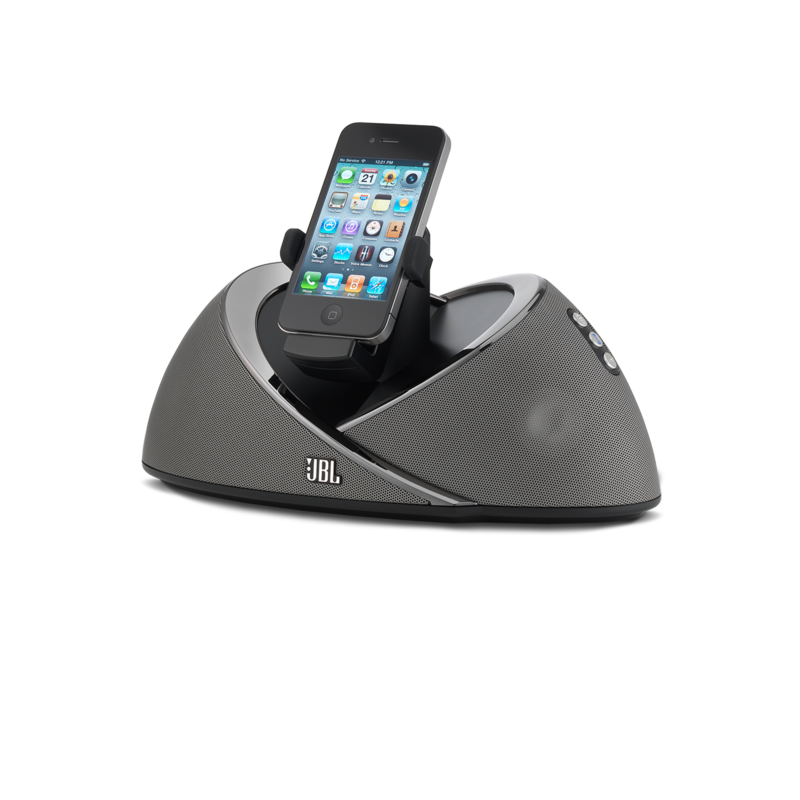 The JBL OnBeat Air dock can accommodate iPad, iPod and iPhone devices. To watch videos and movies in widescreen mode, an adapter clip lets you rotate your docked device from portrait to landscape orientation. Hear your favorite music on the JBL OnBeat Air dock with an accuracy and detail that you wouldn’t have thought possible from a system this small. Full-range JBL Phoenix SE transducers with computer-optimized digital signal processing (DSP) deliver great JBL sound, even when you turn up the volume. Connect the JBL OnBeat Air wireless dock to your desktop or laptop computer via the USB connection. You’ll find that you can easily sync your iTunes collection to any docked device. To watch video content on a big screen, simply connect the JBL OnBeat Air dock to your TV with a composite-video cable. You’ll be amazed at the video quality. With the JBL OnBeat Air dock, you can control audio playback from up to 15 feet (4.6 meters) in any direction. Use the RF (radio-frequency) remote control to navigate your iPad, iPod and iPhone playlists, photos, videos and menus from across the room. When you plug the JBL OnBeat Air dock into an AC power source, it automatically charges any compatible iOS device that you’ve docked into it, even when the system itself is turned off. Your iPad, iPod and iPhone will be ready to go when you are. With its dynamic JBL Weave design, the JBL OnBeat Air dock looks as good as it sounds, and it makes a stylish addition to any listening space. This sturdy dock is light and compact enough to fit almost anywhere and gives you the freedom to have great audio wherever you go. JBL OnBeat™ Air is compact enough to fit just about anywhere you and your friends get together — and it’s engineered to be the life of the party. If music is important to you, you should be hearing it the way it was meant to be heard, whenever and wherever you listen. JBL OnBeat Air will make it happen. Stream your entire iTunes library from any PC or Mac computer – or re-play media from any iPad, iPod or iPhone device running the AirPlay app – with the JBL OnBeat™ Air wireless AirPlay loudspeaker docking station. Compact and lightweight, the system fits easily in any room; but its small size is misleading. A pair of JBL® Phoenix SE full-range transducers produces the acoustic quality that you’d expect from a larger sound system, while built-in AirPlay technology offers the same high-quality sound from all the media on your Wi-Fi® network. Use the included remote control to access any song or playlist from any iOS device within range of your Wi-Fi network, with full playback control. An ingenious rotating connector firmly docks your iPad, iPod or iPhone device for syncing and charging. For optimum display of all your video content, the connector also lets you position iPod and iPhone screens in portrait or landscape mode. You can even display videos on your TV for a whole crowd to enjoy. I have this amazing airplay speaker and yesterday does not working. A massage in itunes says that This speaker is not compatible with the latest vesion of itunes.What should i do to solve this problem ? Thanks in advance.